Tim Sanders is a top speaker on the lecture circuit, former chief solutions officer at Yahoo! Inc, and author of "Love is the Killer App." He has been featured in Time, USA Today, and has appeared on CNN, Today, Fox & Friends, and national radio. 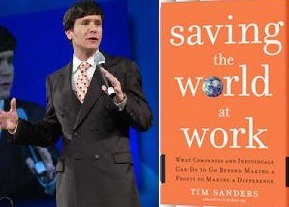 His last book was SAVING THE WORLD AT WORK---WHAT COMPANIES AND INDIVIDUALS CAN DO TO GO BEYOND MAKING A PROFIT TO MAKING A DIFFERENCE (Doubleday and Random House Audio) His website is SavingTheWorld.net. TOWER REVIEW: You talk about college students trending toward social responsibility in choosing companies for employment. Is this due to a shift in curriculum in schools, and are there careers more affected by this change in attitude toward salary than others? TIM SANDERS: The shift comes from a combination of factors including current events, technology and culture influences. Several current events classify as teachable moments, that drill in the concept that we live in an interdependent world where everyone's success is connected to everyone else. 9/11, Enron/WorldCom collapse, Katrina, Inconvenient Truth movie and Wall Street/Home Bubble all confirm this belief. Once that happens, behavior changes as we begin to take and issue responsibility. Technology (I call it the Internet effect) also increases social awareness and activism. Finally culture icons from Bono to Clinton have convinced the new generation that pitching in is not an option, its a survival strategy. Q: We've seen CEOs jump off the crumbling roofs of their corporations with golden parachutes, only to live lavish lifestyles at the expense of those who've bailed them out. Is this to become history, now? How much longer, do you think, will corporate salaries be the measure of esteem among executives, given this shift of values? A: There's a growing backlash against CEO payouts that grossly exceed the value of the executives contribution. Expect that to influence future pay packages. However, there will always be start ups where founders make billions or millions due to their willingness to take on risk. That won't change. Q: What about unions? Will they still more interested in salary and benefits for their members than in saving the environment? In the case of Detroit building SUVs, for example, weren't the unions hoping to preserve the status quo? A: I'm not an expert on unions, but they are not at the forefront of environmental protection. That isn't their charter. They are all about wage/benefit for their members. Collective bargaining. It looks like Congress will require that the Big 3 submit to fuel efficiency standards as a condition of the bailout, and unions will likely lead the way in that negotiation. Q: As you reveal in the book, consumers are now willing to actually pay more for products that are sustainable or recyclable. You even cite Wal Mart as getting into the game, although Costco fares better. How has the current financial crisis affected a changing of the rules there? A: The current financial crisis is a pause in the pay-more-for-good revolution that's been building for over a decade. We saw this in 2002 and 2003, with 2004 and 2005 ushering in millions of new organic, fair trade and good company customers. Expect to see the movement blossom (again) in a few years. Smart companies are planning for it right now. Meanwhile, companies are figuring out how to be green, community focused or good employers without having to raise prices. This is very innovative and will be a tie-breaker even during these times. Q: We keep hearing that bling is out. Does this mean green is finally "in"? No more Hummer-like vehicles with pimped out wheels? A: Good is the new great. Prius, paperless communications and organic Ts are the new bling. Bling is all about social status, taste-making and confidence. Remember mink coats? That used to be hot. Q: Now, at work, especially in government jobs, there's a lot of waste regarding overuse of reports, memos, lights left on, air conditioning running with no one there, that kind of thing. What is the best way for an employee to affect policy change in the office in the case where the supervisor's bonus is not tied to the supplies or utility bill? A: Show everyone else the way. Change your behavior, then encourage/challenge others to do it to. Tell them that it's good for the planet, and saves money too. Remind them that saving money may save someones job in a few months. That will get them off the dime. One worker at a mortgage company decided to reduce document printing at work, so he posted Think Before You Print signs at common computers, along with a short explanation of the environmental hazards behind paper usage. Over a few months, his division cut printing on virgin paper by 30%. I also suggest that small businesses look into eco-profit sharing programs as a way to increase participation. Ive found that you can offer employers one third of the savings (keeping the rest for the bottom line) and still dramatically increase participation in eco-innovations. Q: What are a few things people can do at home to be greener? Personally, I've switched out incandescent bulbs for CFCs, and gotten rid of my television. A radical act, some would say, but it saves me from about a million commercials for things I don't really need. A: CFLs are a big start. Half of all electricity is devoted to lighting, so increase efficiency there makes a huge difference. Reducing your auto usage or emissions is big too. Combine less driving with high MPG and you move the needle. Besides your personal usage issues, influence is a big way to make a difference. Require green-ness from all your suppliers, from dry-cleaner to grocery. They will respond to customer requests. That way, you can go beyond being less bad. Q: Any thoughts on cutting back on beef consumption, bottled water, soda, and its relationship to pollution and rising health care costs for companies? What can CEOs do to encourage more responsible habits at the workplace that may translate to people adopting those practices in their private lives? A: Beef consumption is tied to pollution, global warming, water waste and heart disease. Bottled water is the new Hummer. With respect to companies, the magic bullet may be wellness programming. For a small fee, you can bring in trainers to teach your employees diet, exercise and smoking cessation. For every dollar you spend, you'll save three in health care claims and increased productivity. You'll also teach people how to take care of their bodies, which leads to an increased respect for the planet. That's what Adam Werbach (former Sierra Club president) found out when he was hired to teach eco-sensibility to Wal Mart employees. Q: Efficiency is the watchword for tomorrow's cars, but this extends to appliances, homes, and buildings too. Thomas Friedman, in his book "Hot, Flat and Crowded," made the scary point that the world is about to add another six Americas in the sense of consumption of natural resources worldwide, due to rising standards of living. This is unsustainable without a radical shift, not just in values, but in innovation. Of course Dubai is now constructing buildings that are partially self sustaining, but they have the advantage of capital to finance their architects. Do you share Friedman's optimism that solutions will come, even for us, in this so-called "post-American world?" A: We all need to dramatically reduce our requirements of the planet to create a sustainable world. We need to, as a global community, help struggling nations reduce their birth rate too. I'm an eternal optimist and believe that we can find new ways to increase the supply of resources and make this planet big enough for a few billion more people. Why? Because our next generation is wired for it. They consider it their legacy (as opposed to independence, which was the boomers Ayn Rand driven goal). In the meantime, here's the way to think about it all: The planet is like a start up company that is running out of money. The product team is working night and day to find a breakthrough product that reverses the trend and brings precious money in the door. Meanwhile the rest of the company needs to save money to cut the burn rate and give the product team some extra time. We are the rest of the company and the eco-innovators are the product team. We need to innovate, buckle down and buy them some time to come up with solutions that preserve the environment. Q: One final question. You narrate your own book on audio. What was the experience like for you, and how is it different than getting up on the podium in your lecture circuit? A: It's pretty hard. You have to read in a studio for several days, get it all absolutely correct and maintain energy and passion. On the lecture circuit, I'm not reading off a script or a teleprompter!